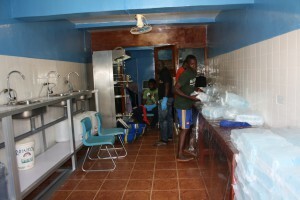 We proudly announce the set-up of a water shop running on a UV WaterBox in Freetown, Sierra Leone. 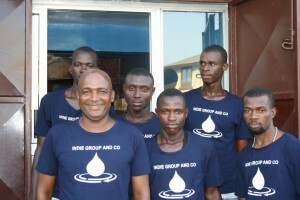 The shop is run by the indie Group and producing up to 8.000 small water sachets per day. CEO of the Indie Group is Mr. Clett Johnston. Mr. Johnston mentioned to us: ‘We are very proud to have opened this first water shop. 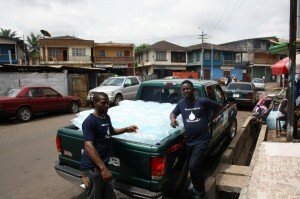 People tell us that we produce the best water in Freetown. They like is so much that at present we are already thinking opening a second watershop in combination with a large hospital in Freetown’. These pictures display the water sachettes being produced and ready for transportation. AAWS produced for the Indie Group a new type of UV WaterBox linked the production of water to the activity of the UV lamp. If you are interested to learn more about this application, don’t hesitate to send us an email.